NewBlue Amplify 6 is offered to you either as complete or plus version to an extremely favourable price until 31. May 2018. In our Interview with Todor Fay, CEO of NewBlue, you get further information about this excellent plug-in. Furthermore, Grass Valley presents the new version of its Transcoder, the XRE Transcoder 9 with new great features. Finally, in our Report on the new T2, Grass Valley present its new version of the GV T2 iDDR Recorder/Player. At the NAB show, Grass Valley introduces version 9.20 of its EDIUS editing solution, which now includes additional HDR video control tools, new color spaces and a floating license model. As always, EDIUS 9 users will benefit from the update free of charge as part of the regular product enhancement program by Grass Valley. With the latest updates, EDIUS has been provided with more and more options for professional color grading, new color spaces and HDR processing. The new video scopes from EDIUS 9.20 offer comprehensive control and analysis functions to achieve the optimal dynamic range. In addition to REC.709, the video scopes now also support new color spaces and offer the nits display essential for HDR. In addition to the Waveform Monitor and Vectorscope, EDIUS 9.20 now also offers the display as an RGB parade, as well as an RGB histogram, which, together with the primary color correction, enable particularly efficient fine tuning. 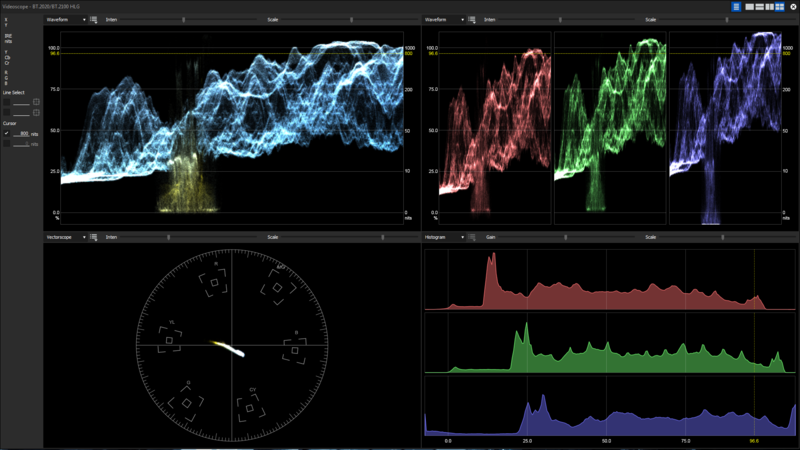 EDIUS 9.20 now also supports the color spaces ARRI-ALEXA Wide Gamut / Log C and DJI-D-Gamut / D-Log. 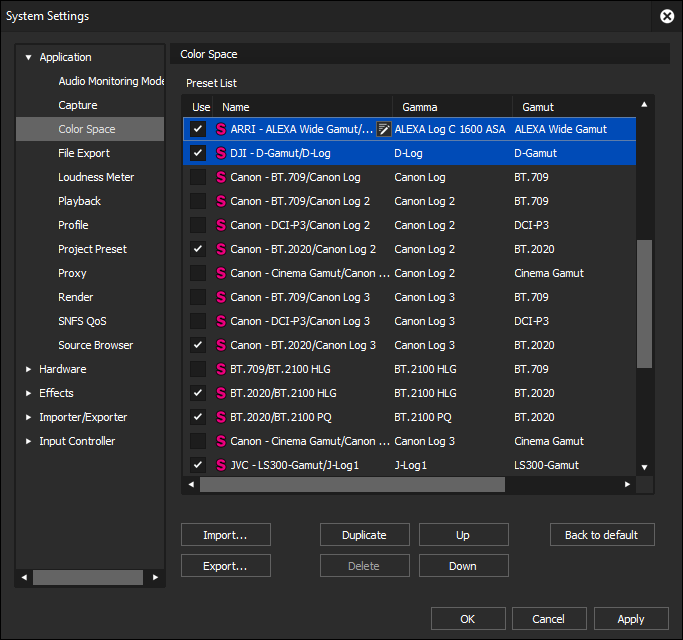 Applying the newly introduced color space templates manager, the user can simply deselect any presets not needed and thus obtains an optimal overview with the option to further modify settings to individual needs. Modified template lists can be exported for use with other EDIUS systems. 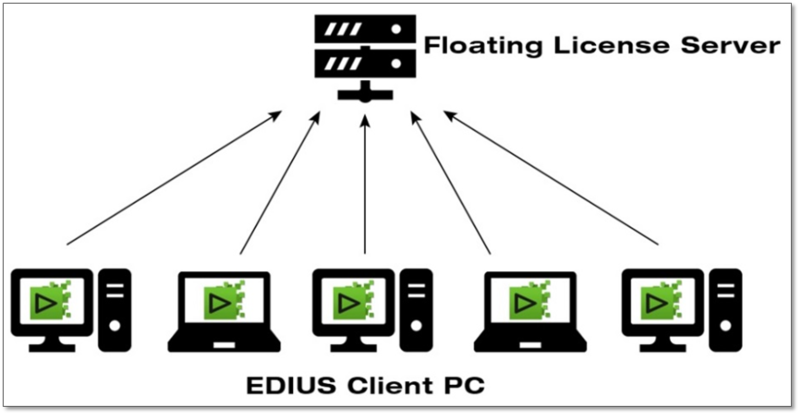 The "Floating License" model allows the installation of EDIUS 9 onto an unlimited number of workstations within a facility. As a purchase and not a rental model the licensee benefits from only paying for the desired maximum numbers of concurrent active EDIUS users independent from the number of installations. The license model is available starting from five EDIUS Pro 9 or Workgroup 9 licenses. For educational institutions, as with the regular EDIUS version, reduced rates apply. 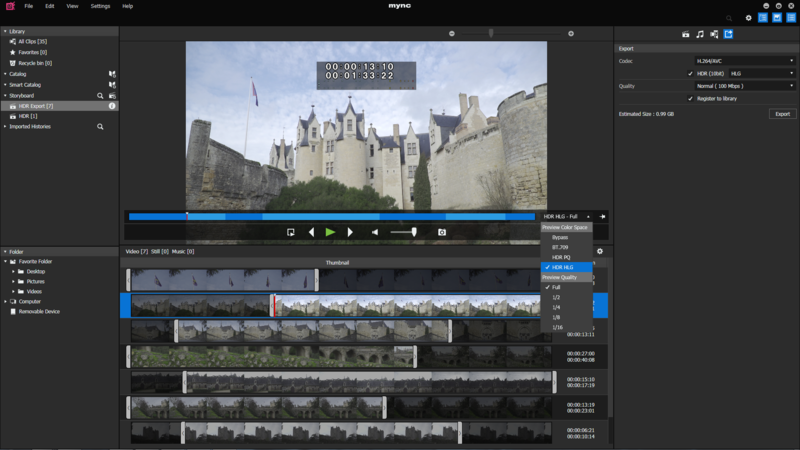 The Mync Media Manager now supports an HDR workflow including preview, storyboard editing and export. intel Quicksync systems of the 6th, 7th or 8th generation allow an H.265 export. 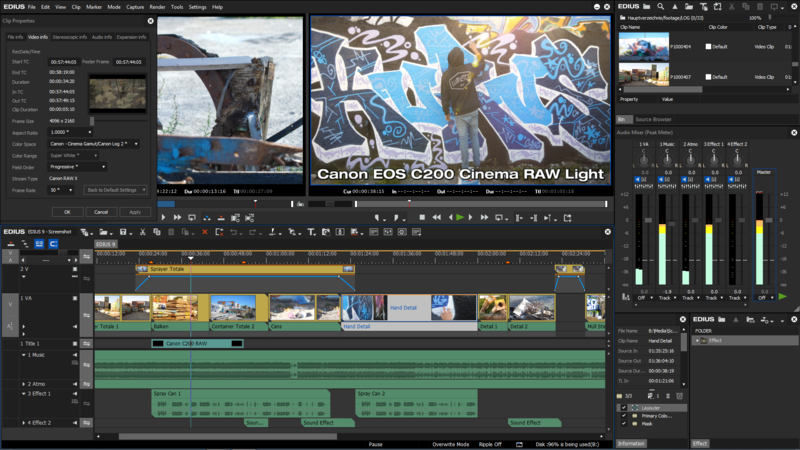 EDIUS 9.20 now supports the import of Apple ProRes MXF and Sony VENICE RAW. The processing of Canon Cinema RAW Light material of the Canon C200 has been optimized and thus considerably accelerated. Please find the download of version 9.20 as well as the podcast introducing all new features in EDIUS 9.20. EDIUS is a regular winner in professional journals’ comparative tests and one of the most frequently used video editing solutions. The software is equally popular with video enthusiasts, Youtubers, event filmmakers, universities and colleges, industry, production houses, TV broadcasters and government agencies. EDIUS 9.10 is now available via download. File export with the modern and even more effective H.265 Codec, 8bit and 10bit export. Please note: The complex H.265 encoding is available in combination with an appropriate hardware encoder only. Hence the H.265 export is only possible with processors that have a QuickSync hardware encoder integrated ( list of appropriate processors with QuickSync). Without such a processor the H.265 export is currently not possible. The latest intel processors with integrated GPU contain such a hardware encoder. The 6th generation (Skylake) supports the H.265 export in 8bit in the main profile. The 7th generation (Kaby Lake) and the 8th generation (Coffee Lake) additionally allow the H.265 export in 8bit as well as 10bit in the main profile. Import and automatic recognition of Sony XAVC/XAVC-S Proxy-files. Workflow: The proxy files can be transferred directly to the editing suite at the TV station from the camera, via FTP or from the memory card, via laptop. They can also be edited on a simple laptop. Therefore the proxy files are imported and the project is edited. When the high resolution XAVC footage is finally available after a lengthy data transfer or via a memory card, the proxy files can be replaced. When importing them EDIUS automatically recognizes the missing, high resolution footage. As soon as EDIUS has the complete XAVC data available, the software also automatically uses the proxy files. When switching to proxy mode via mode, EDIUS no longer needs to generate proxy files as was required before. Fast tagging of files via shortcuts, subclip workflow for generating shorter clips inter alia for a more accurate trimming and dividing a long clip into fragments, multiple still image preview (up to 10 still images simultaneously) for a better overview and a simplified ratings process, extended reading and integration of file metadata, adoption of the original data taken from the source when generating snapshots. Elimination of certain issues, progress bar on the EDIUS icon in the taskbar when exporting and rendering selected clips. For Christmas 2017, Grass Valley will be offering all current and future EDIUS 9 users the professional and comprehensive title software NewBlue Titler Pro 5, along with additional extensions and template packages totaling over € 400. Even if users just make an (cost-effective) upgrade to EDIUS 9, you get the professional titling software for free. Information about the download, the installation and the first steps we give in our current EDIUS 9 podcast. Here you find more information about NewBlue Titler Pro 5. Grass Valley’s newest release of EDIUS, known as an outstanding powerful and reliable editing solution, will be available in Europe on 7th November. EDIUS version 9 supports High Dynamic Range (HDR) in a most user friendly way including import, editing and export like no other editing solution. In addition to the established Log flavors EDIUS 9 fully supports Hybrid Log Gamma (HLG) provided by several newer Sony and Panasonic cameras. With HLG the picture will look great on any standard screen and will look even better on an HDR monitor. EDIUS 9 is able to detect the recorded color space and automatically applies the correct settings for native editing. EDIUS 9 supports a wide range of HDR sources (PG & HLG) including professional cameras as well as drones, action cams and smartphones, converts from SDR and Log to HDR and allows mixing of SDR and HDR on the same timeline. Compatible I/O-cards and monitors allow a true HDR preview. HDR-projects can be exported for playback (as H.264, 10bit, 4:2:2) on HDR TVs as well as YouTube. More than that EDIUS 9 supports a wide range of color spaces including BT.2020 and BT.2100. It further natively supports Cinema Raw Light of the Canon C200 as well as 10bit Cinema DNG. Grass Valley continues the “buy once and use forever” ownership model. Users are not forced into any subscription plan. A new Floating License model for enterprise customers offers the desired flexibility to larger companies that can now make EDIUS available to all of their desks – only taking into account the number of seats being active at the same time. Furthermore, EDIUS can now be used in the cloud with direct access to cloud based footage, eliminating the need for up- and downloading huge amounts of data. As before Grass Valley will continually add more features to EDIUS 9 – all free of charge – during the approx. two years lifecycle of EDIUS 9. This will include new tools and features – as desired by the EDIUS community – like an automated audio syncing of multiple tracks, H.265 file export, 8K and High Frame Rate support, and more to come. EDIUS will be available as EDIUS Pro 9 and EDIUS Workgroup 9. 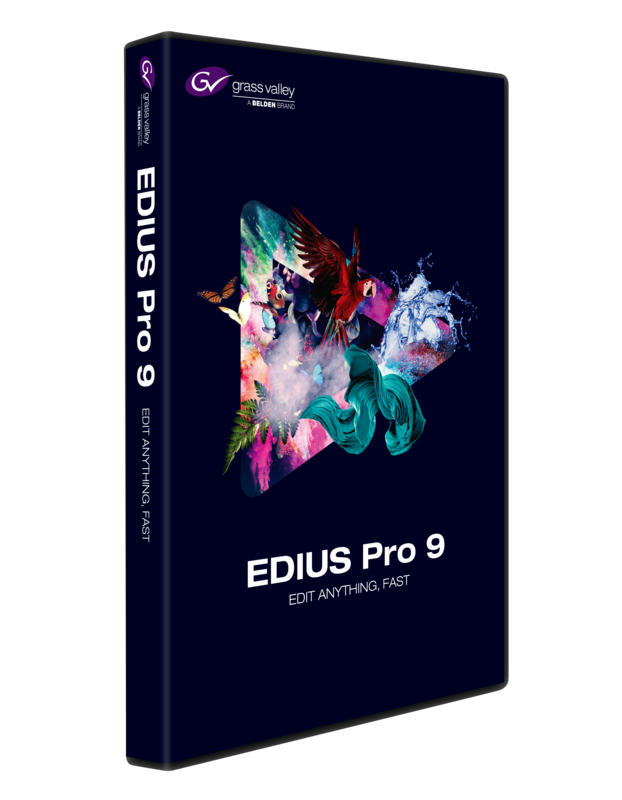 EDIUS Pro 9 is the perfect choice for any video enthusiast, journalist, editor and creative filmmaker. The Workgroup version addresses larger teams, broadcast stations and live event production teams. EDIUS 9 Workgroup Users already editing UHD in 50p/60p will appreciate the new option to preview UHD in 50p/60p applying a compatible third party I/O card manufactured by companies like Blackmagic Design or AJA. The support of closed caption titling and background rendering will also follow in the course of the free EDIUS 9.x Workgroup updates. Customers in about every country of Europe, Middle East and Africa benefit from local resellers, certified as EDIUS experts providing individual support and assistance. “We are pleased that Grass Valley has listened to customers’ wishes and continues the ‘buy once and use forever’ ownership model” says Michael Lehmann-Horn, Grass Valley Distributor for Europe, Middle East and Africa. “We know from dealers as well as customers that EDIUS users appreciate owning the program as much as enjoying the performance and the new features”. Free video trainings and EDIUS tutorial podcasts are available in Englisch, French and German with subtitles in even more different languages. EDIUS.NET is available in English, German, French, Italian and Spanish and is the source for getting in touch with the local EDIUS community and for downloading a free 30 days trial version. Here users can learn even more about new features in EDIUS 9 like the included Mync program with enhanced and new functions to organize, search, preview and share footage and other media files. For purchases of EDIUS 8 after 1st September 2017, a free upgrade to EDIUS 9 will be available, and for users of earlier versions, a jump upgrade package will be offered. Complete details are available at the EDIUS product page at WWW.EDIUS.NET.